I'm in desperate need for some time off lately, I'm sure that this time of year you're all feeling the need for rest, relaxation and all day pajamas, I hear ya! I've been dreaming about my upcoming vacation to Mexico, pretty much counting down the moments until I feel the sand and sun. I've been recovering over the last few weeks from whiplash, after recently being in a car accident. Yes I'm going to completely skip over what happened because luckily nobody was hurt and thankfully it wasn't my fault, but I'm ready for some days off, like 14 of them in a row - at least. 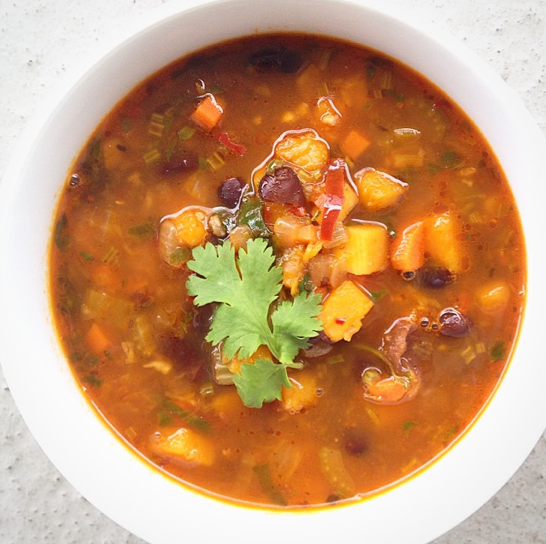 In the meantime I crave flavors of spicy, smoky and sweet, you know anytime any day I'm ready to enjoy a big bowl of soup so I was super inspired when I whipped this deliciousness up. I had some black beans I had cooked the day before, yes most of us health nuts actually cook our own beans, it's so much better then opening a can and way healthier. I wanted to do something satisfying, spicy and vegetarian. Soup is the ultimate way to pack vital nutrients into your body and it just happens to also be my favorite thing to cook as you've noticed if you've been following me the last five years. 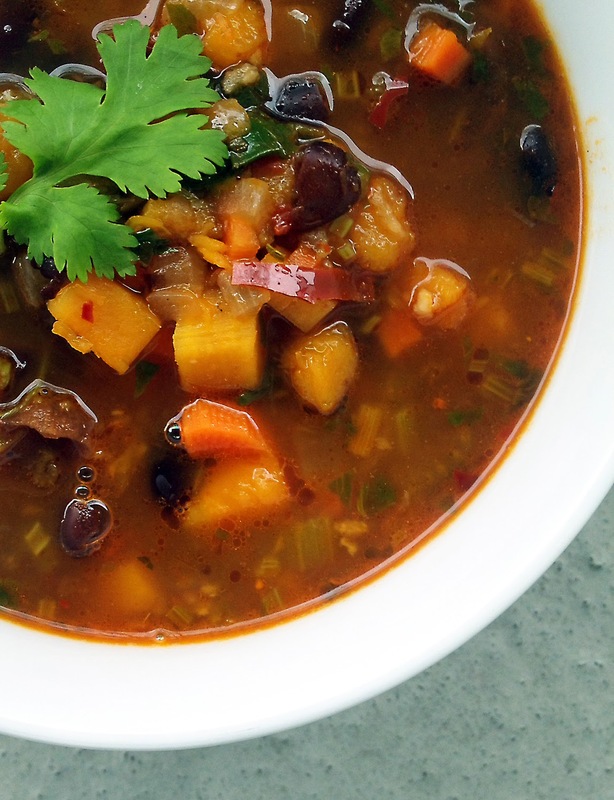 This soup takes roughly 30 minutes and will knock your sox off! Sautee the onion in coconut oil, add garlic and continue until translucent then add in the carrot, celery and squash. Cook until everything is soft about 5 -10 mins. Add pasatta, chillies, dry spiced and herbs and continue to cook for another minute then add stock, beans and cilantro. Simmer until veggies have softened then add in the tamarind paste. A splash of lime juice and fresh chopped cilantro leaves.